Smell our Afrodesia fragrance based Incense Stick and feel the paradise on earth. This stick gradually burns immersing a fragrance that enchants one and all. Our Floral Series collection helps you to focus on God during prayers. 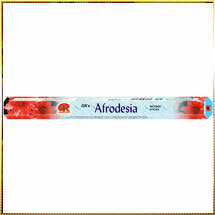 We assure you that this Afrodesia Incense Stick with its heavenly fragrance and long length will help to connect with God more easily. It is made by using aromatic flowers and other ingredients that retains the purity of religion and faith. Fragrance for this Incense stick has been extracted from fresh flowers ensuring zero amalgamation of unwanted materials. However, when it comes to prices, we offer it at the most discounted prices.